I've tried putting the new cylinder in both ways and from both sides. I also took the handle off completely to see if that would help me angle it in better. 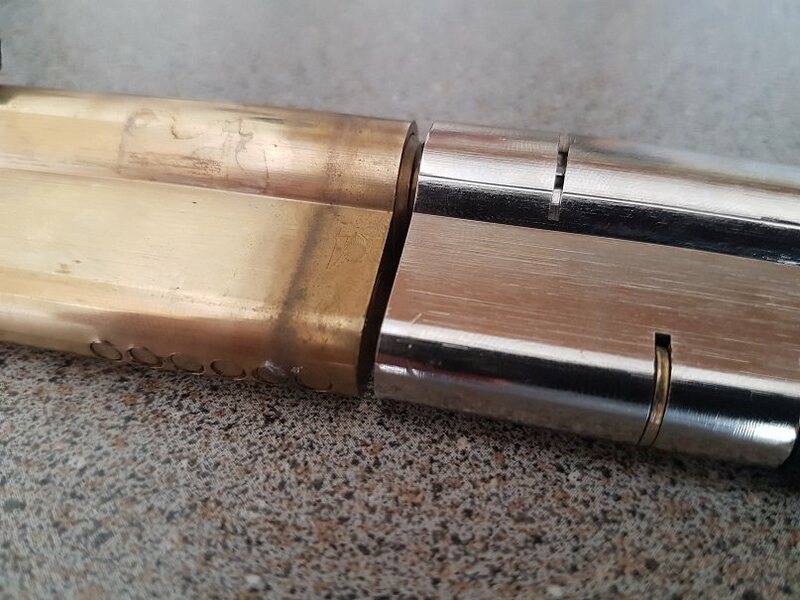 From what I can tell, the old cylinder doesn't have any unique mark or indentations that would mean it's not interchangeable with other cylinders. The sizes look identical, but there must be a slight difference somewhere. Anyone know if there's anything I can do? It will obviously be really awkward if I need to keep ordering cylinders from different manufactures, hoping eventually one will fit. You could loosen the handle screws in case that is offset and pushing the lock to one side. If it is just a thin piece of metal catching a bit of careful work with a round file could create the clearance. Take the handle off first so you don't damage it and I would be tempted to put a vacuum cleaner on the other side to prevent the metal particles dropping into the mechanism. That may be considered a bodge though. I thought of that this morning but then realised OP had said that he had removed the handle completely. how tight is it ? your pic shows it the handle is the issue but you say it will not fit through the door ? 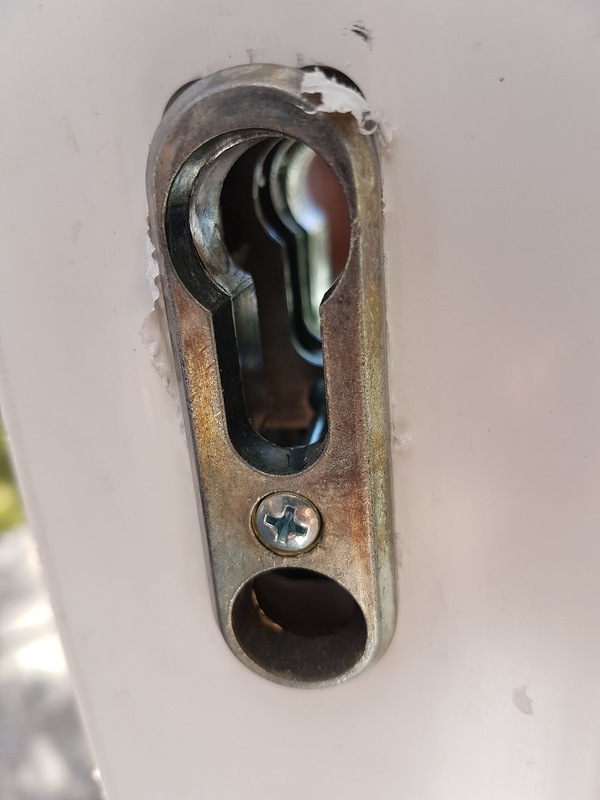 The metal bit shown in the picture that's causing the issue isn't connected directly to the handle and is fixed inside the door, but it does have enough give to move around slightly. 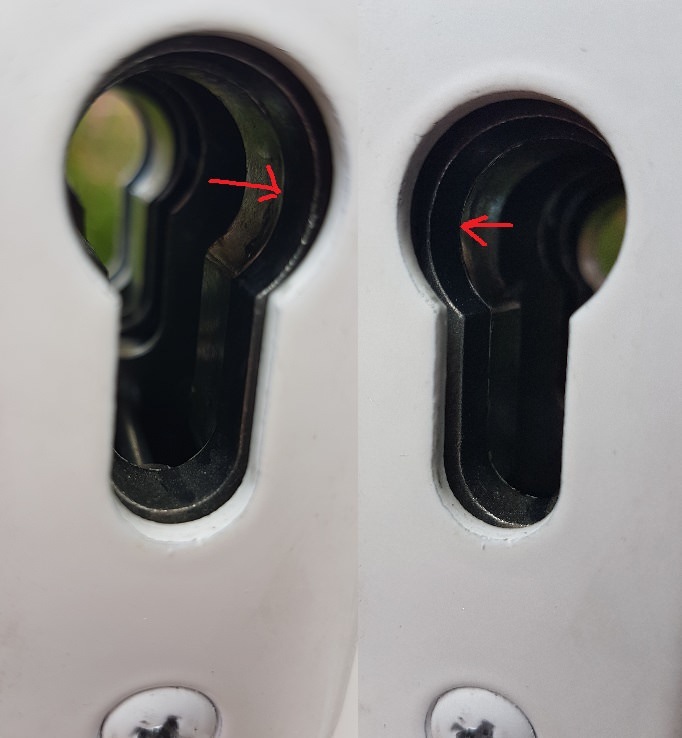 There's one of these metal brackets that holds the cylinder in place on either side of the door and they appear to be connected to each other by a long screw which can be faintly seen in the first picture. I tried putting the cylinder I'd taken out of the front door in to the back door and that also wouldn't fit. I'm hoping to find another solution before trying to file down the obstruction as the slight ridge that's causing the issue continues around the entire shape of the cylinder, so filing it would be quite hard. Does the bracket that holds the cylinder have a name? Or is it just part of the door? I was wondering whether I could try replacing that. How about posting a picture with the handles removed so we can see what you are seeing. Have you got one of these fitted ? Last edited by Bob225 on Thu Jun 28, 2018 7:50 pm, edited 1 time in total. Good call. Never come across those so good to know and stored in my memory bank... just incase.